KXStudio includes a program called Wine (Wine Is Not an Emulator) which allows most MS Windows software to run under GNU/Linux. It is FLOSS and does not require a copy of Windows to run. While a number of Windows applications will not run at all under Wine, there is the odd app or game that runs BETTER under Wine than real Windows! In most cases though, MS Windows apps run slower under Wine than under a genuine Windows install. Overall, it is recommended to run native GNU/Linux software instead of using Windows software under Wine, but the option of Wine allows flexibility if no suitable, Linux-native alternative software is available currently for a specific task. Audio Stream Input/Output (ASIO) is the most common low-latency sound card driver protocol for MS Windows, hence most professional Windows audio software is designed to work with ASIO. KXStudio includes WineASIO which provides an ASIO to JACK driver for Wine. This allows ASIO-compatible Windows software running under Wine to access your JACK device/server as if it was an ASIO device. You should only need to issue these commands once, if at all, but there is no harm in re-running them. KXStudio includes the MS Windows version of REAPER (Rapid Environment for Audio Production, Engineering, and Recording). REAPER is proprietary software which runs as a fully-functional demo for trial. It is one of the most powerful and popular DAWs available for Windows and Mac OSX, and a native Linux version is in development. REAPER has proven popular under GNU/Linux due to its advanced audio production features, its not-FLOSS-but-nonetheless-user-friendly licensing and its official support for running the Windows version under Wine. If you are using a 32-bit system, choose windows installer for reaper 32bits and for a 64 bits, choose windows installer for reaper 64 bits. You can simply install reaper by double clicking on the file you just download and follow the steps shown in the window that should opened. Then be really carefull to NOT CHECK rearoute (ASIO driver) installation. Installing rearoute could result in a conflict with WineASIO. then don't forget to register wine as mentionned in the previsous chapter : Registering WineASIO libraries. 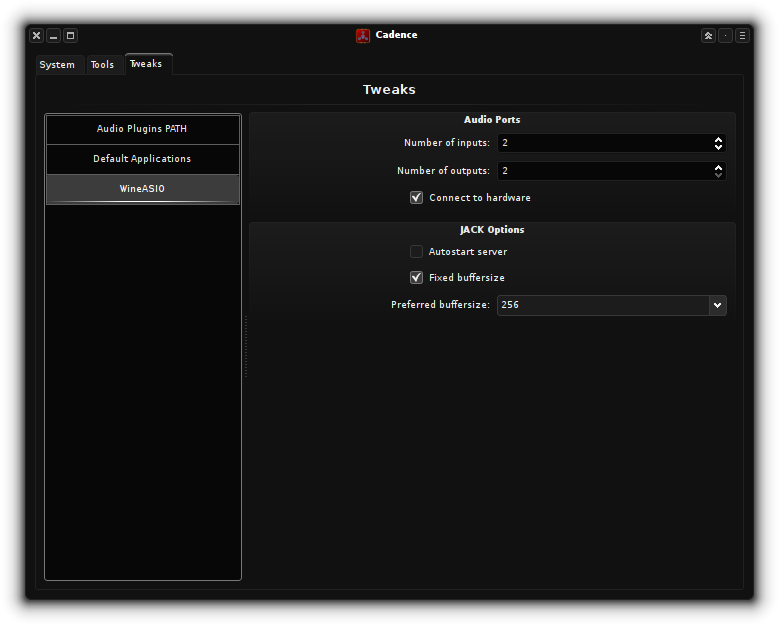 Choose ASIO from the Audio drop-down menu at the top of the Audio device settings options. You should then see 'WineASIO Driver' is selected as the ASIO driver. To prevent some misconfiguration between REAPER and Cadence tools (Claudia or Catia), you have to set REAPER options. So, in REAPER, go to options > Preferences, then click on Audio (in the left list panel) and uncheck “close audio device when stopped and applicatin is active”.